This Web Font End-User License Agreement for the use of web fonts (the “Agreement ”) is a legal agreement between you and MyFonts that governs the use of the Licensed Web Fonts that you license from MyFonts website located at www.myfonts.com, and which are accompanied by or refer to this Agreement. This Agreement becomes a binding contract between you and MyFonts when you click on the area marked “ACCEPT LICENSE AGREEMENT,” or similar language or when you accept the Agreement by other means (for instance referring to the Agreement in a purchase order, a confirmation email, etc.). If you do not wish to be bound by the Agreement, you cannot access, use or download the Licensed Web Fonts. Please read this entire document before agreeing to be bound. Certain capitalized terms are defined in Section 9 of this Agreement. 1. Binding Agreement. You are bound by the Agreement and you acknowledge that all Use of the Licensed Web Fonts is governed by the Agreement. •	You may not link to, nor put online, any version of a Licensed Web Font not supplied in a Web Font Kit. •	The Licensed Web Fonts may be used on any Website owned or controlled by you (subject to the next bullet point). The total traffic, measured in page views, of all Websites Using a Licensed Web Font must be no greater than the number of page views specified in your account at located at www.myfonts.com. Businesses or organizations such as advertising agencies, web design agencies or hosting providers that are responsible for multiple clients’ Websites must enter into separate Agreement’s for each client Website. •	The Licensed Web Fonts may be used in a Website where visitors produce Styled Content by directly or indirectly selecting a Licensed Web Font and entering or editing content using that Licensed Web Font, if and only if the Website does not enable or facilitate the Styled Content being used outside the Website. Examples of using Styled Content outside of a Website include but are not limited to producing merchandise, PDF documents, image files, or personalized physical objects using the Styled Content. •	You may not use conversion or editing tools on the Licensed Web Fonts. •	Use of the Licensed Web Fonts with technologies other than @font-face, such as sIFR, Cufón or Typeface.js, is not allowed. •	You must retain the page view tracking code, as supplied in the Web Font Kit, on all Websites that Use the Licensed Web Fonts. You shall identify all Licensed Web Fonts to visitors of Websites only by the Licensed Web Font’s original name and in accordance with accepted trademark practice, including identification of the trademark owner’s name. The Website’s font selection user interface must display the Licensed Web Font’s original name(s) and cite the source of the Licensed Web Font. You will only use the Licensed Web Font’s original name(s) to identify a Licensed Web Font which effects a faithful reproduction of the underlying font and which is of a quality sufficient to meet industry typographic quality standards. 3. Intellectual and Industrial Property Rights. You agree that the Licensed Web Fonts are protected by the copyright law and other intellectual and industrial property rights of the United States of America and its various States, by the copyright law and other intellectual and industrial property rights of other nations, and by international treaties. You agree to treat the Licensed Web Fonts as you would any other copyrighted material. You may not copy the Licensed Web Fonts, except as expressly provided herein. You agree not to adapt, modify, alter, translate, convert, or otherwise change the Licensed Web Fonts, or to create Derivative Works from the Licensed Web Fonts or any portion thereof. You further agree not to use the Licensed Web Fonts in connection with software and/or hardware which create Derivative Works of the Licensed Web Fonts. You agree not to reverse engineer, decompile, disassemble, or otherwise attempt to discover the source code or instructions of the Licensed Web Fonts, provided, however, that if you are located in a European Community member country or any other country which provides rights materially similar to the rights set forth in this provision, you may reverse engineer or decompile the Licensed Web Fonts only to the extent that sufficient information is not available for the purpose of creating an interoperable software program (but only for such purpose and only to the extent that sufficient information is not provided in a timely manner free of charge by MyFonts upon written request). You agree that MyFonts, or its third party licensors, owns all right, title and interest in and to the Licensed Web Fonts, their structure, organization, code, and related files, including all intellectual and industrial property rights therein such as copyright, design and trademarks rights. You agree that the Licensed Web Fonts, their structure, organization, code, and related files are valuable property of MyFonts or its third party licensors and that any intentional or negligent Use of the Licensed Web Fonts not expressly permitted by the Agreement constitutes an infringement of intellectual and industrial property rights. You agree to use trademarks associated with the Licensed Web Fonts according to accepted trademark practice, including identification of the trademark owner’s name. The use of any trademark authorized herein does not give you any rights of ownership in that trademark and all use of any trademark shall inure to the sole benefit of MyFonts. You may not change any trademark or trade name designation for the Licensed Web Fonts. 4. Warranty; Limitation of Liability. MyFonts warrants to you that the Licensed Web Fonts will perform substantially in accordance with W3C specifications for the use of fonts in conjunction with the ‘@font-face rule’ specified in the cascading style sheets (“CSS”) specification set forth on the http://www.W3.org website as of the date of this Agreement for the twenty-one (21) day period following delivery of the Licensed Web Font(s). To make a warranty claim, you must, within the twenty-one (21) day warranty period, contact MyFonts with sufficient information regarding your licensing of the Licensed Web Font(s) so as to enable MyFonts to verify the existence and date of the license. If the Licensed Web Font(s) do not perform substantially in accordance with W3C specifications for the use of fonts in conjunction with the ‘@font-face rule’ specified in the cascading style sheets (“CSS”) specification set forth on the http://www.W3.org website as of the date you agree to be bound by this Agreement, the entire, exclusive, and cumulative liability and remedy shall be limited to the refund of the license fee you paid to MyFonts to obtain delivery of the Licensed Web Font(s). MYFONTS DOES NOT WARRANT THE RESULTS YOU MAY OBTAIN BY USING THE LICENSED WEB FONT(S). THE FOREGOING STATES THE SOLE AND EXCLUSIVE REMEDIES FOR MYFONTS’ BREACH OF WARRANTY. EXCEPT FOR THE FOREGOING LIMITED WARRANTY, MYFONTS MAKES NO REPRESENTATIONS OR WARRANTIES, EXPRESS OR IMPLIED, AS TO NON-INFRINGEMENT OF THIRD PARTY RIGHTS, MERCHANTABILITY, OR FITNESS FOR ANY PARTICULAR PURPOSE. IN NO EVENT WILL MYFONTS BE LIABLE TO YOU OR ANYONE ELSE (I) FOR ANY CONSEQUENTIAL, INCIDENTAL OR SPECIAL DAMAGES, INCLUDING WITHOUT LIMITATION ANY LOST PROFITS, LOST DATA, LOST BUSINESS OPPORTUNITIES, OR LOST SAVINGS, EVEN IF MYFONTS HAS BEEN ADVISED OF THE POSSIBILITY OF SUCH DAMAGES, OR (II) FOR ANY CLAIM AGAINST YOU BY ANY THIRD PARTY SEEKING SUCH DAMAGES EVEN IF MONOTYPE IMAGING HAS BEEN ADVISED OF THE POSSIBILITY OF SUCH DAMAGES.. Some states or jurisdictions do not allow the exclusions of limitations of incidental, consequential or special damages, so the above exclusion may not apply to you. Also, some states or jurisdictions do not allow the exclusions of implied warranties or limitations on how long an implied warranty may last, so the above limitations may not apply to you. To the greatest extent permitted by law, any implied warranties not effectively excluded by this Agreement are limited to twenty-one (21) days. Some jurisdictions do not permit a limitation of implied warranties where the product results in physical injury or death so such limitations may not apply to you. In those jurisdictions, you agree that MyFonts liability for such physical injury or death shall not exceed One Hundred Thousand Dollars ($100,000) United States dollars, provided that such jurisdictions permit a limitation of such liability. This warranty gives you specific legal rights. You may have other rights that vary from state to state or jurisdiction to jurisdiction. The Licensed Web Font(s) are non-returnable and nonrefundable. 5. Transfer of the Licensed Web Fonts. You may not rent, lease, sublicense, give, lend, or further distribute the Licensed Web Font(s), or any copy thereof, except as expressly provided herein. You may transfer all its rights to use the Licensed Web Font(s) to another person or legal entity provided that (i) the transferee accepts and agrees to be bound by all the terms and conditions of this Agreement, and (ii) you destroy all copies of the Licensed Web Font(s), including all copies stored in the memory of a hardware device. If you are a business or organization, you agree that in case of a reasonable doubt with regard to the proper Use of the Licensed Web Font(s) within your organization, upon request from MyFonts or its authorized representative, you will, within thirty (30) days, fully document and certify that the Use of any and all Licensed Web Fonts licensed by you from MyFonts at the time of the request is in conformity with your valid licenses from MyFonts. 6. Copies. You may make one back-up copy of the Licensed Web Font(s) for archival purposes only, and you shall retain exclusive custody and control over such copy. Any copies that you are expressly permitted to make pursuant to the Agreement must contain the same copyright, trademark, and other proprietary notices that appear on or in the Licensed Web Font(s). Upon termination of Agreement, you must destroy the original and any and all copies of the Licensed Web Font(s). 7. Termination. Upon failure by you to comply with the terms of the Agreement, MyFonts shall be entitled to terminate the Agreement upon notice by regular mail, paid carrier, telefax or email/textform. The termination of the Agreement shall not preclude MyFonts from suing you for damages for any breach of the Agreement. The Agreement may only be modified in writing signed by an authorized officer of MyFonts. 8. Other Terms and Conditions. In the event that any provision of this Agreement is unenforceable or invalid, such unenforceability or invalidity shall not render this Agreement unenforceable or invalid as a whole, and, in such event, such unenforceable or invalid provision shall be changed and interpreted so as to best accomplish the objectives of such provision within the limits of applicable law or court decisions. You agree that the Licensed Web Fonts may not be shipped, transferred or exported into any country or used in any manner prohibited by the United States Export Administration or any applicable export laws, restrictions or regulations. If the Licensed Web Fonts licensed to you by MyFonts re acquired under the terms of a (i) GSA contract - use, reproduction or disclosure is subject to the restrictions set forth in the applicable ADP Schedule contract, (ii) DOD contract - use, duplication or disclosure by the Government is subject to the applicable restrictions set forth in DFARS 252.277-7013; (iii) Civilian agency contract - use, reproduction, or disclosure is subject to FAR 52.277-19(a) through (d) and restrictions set forth in this Agreement. This Agreement is governed by the laws of the Commonwealth of Massachusetts applicable to contracts wholly entered and performable within such Commonwealth (without regard to applicable conflict of laws provisions). The United States District Court for the District of Massachusetts or, if federal subject matter jurisdiction is lacking, the Superior Court of the Commonwealth of Massachusetts in Middlesex County, shall be the exclusive forum for any disputes arising out of or related to this Agreement. Both you and MyFonts agree to the personal jurisdiction and venue of these courts in any action related to this Agreement. The Agreement will not be governed by the United Nations Convention of Contracts for the International Sale of Goods, the application of which is expressly excluded. “Derivative Work”	means binary data based upon or derived from the Licensed Web Font(s) (or any portion of the Licensed Web Font(s)) in any form in which such binary data may be recast, transformed, or adapted including, but not limited to, binary data in any format into which the Licensed Web Font(s) may be converted. “MyFonts”	means Bitstream Inc., doing business as MyFonts. “Styled Content”	means any content produced on a Website by a visitor to such Website through Use of the Licensed Web Fonts. “Use”	of the Licensed Web Fonts shall occur when an individual is able to give commands (whether by keyboard or otherwise) that are followed by the Licensed Web Fonts, regardless of the location in which the Licensed Web Fonts resides. “Use” of the Licensed Web Fonts shall also occur when the software or instructions are executed. “Web Font Kit”	means a repository for the bundling of Licensed Web Fonts for Use on a Website. A Web Font Kit shall contain page view tracking code which must be retained by you and placed on all Websites which Use any Licensed Web Fonts. “Website(s)”	means a web site or web sites (i.e., a collection of web pages, images, videos or other digital assets that are hosted on one or more web servers, accessed from a common root Uniform Resource Identifier (URI)) which: (i) Uses or accesses the Licensed Web Font(s) in its web pages, (ii) does not in any way enable the permanent installation of the Licensed Web Font(s) by Website visitors on any printer or display which displays a screen image created by Use of or access to the Licensed Web Font(s), and (iii) reasonably restricts access to Licensed Web Font(s) from Use or access by web pages or any document not originating from such Websites. “MyFonts” is a service mark of Bitstream Inc. registered in the U.S. Patent and Trademark Office. All other trademarks are the property of their respective owners. MyFonts’ mailing address is: 600 Unicorn Park Dr., Woburn, Massachusetts 01801. All inquiries and requests for licenses may be sent via e-mail to: help@myfonts.com. MyFonts’ website is located at www.myfonts.com. The word ‘Ghibli’ per se refers to a Saharan hot and dry wind commonly known as the Sirocco. In Arabic language, ‘Ghibli’ is known as ‘Qibli or Kibli’, meaning ‘Southern’ for those Arabic nations who live in the North of Africa. The ‘Ghibli’ wind is most common during spring and autumn, and can blow at almost 60mph; it is this wind which is responsible for the dry, dusty conditions on the Mediterranean coast of North Africa. ‘Ghibli’ can last for days making life miserable and is therefore feared by the desert dwellers in that region. It can also have profound effect on the landscape by moving vast quantities of sand and dunes. Inspired by the Studio Ghibli’s unique and magical characters, the ‘Ghibli’ typeface is designed as a Latin free and literary serif typeface. It strongly expresses transition, imagination, sharpness, characterization, and modernization. It is a literary type that can capture the eyesight of readers and other observers with its acute and stylistic letterforms, dots, and numerals. It has transitional serifs and it is generally based upon the Latin printing style of the 18th and 19th centuries, with a pronounced vertical contrast in stroke emphasis (i.e., vertical strokes being heavier than the horizontal strokes). It has more regular forms in which serifs are bracketed and more symmetrical. The main characteristic of ‘Ghibli’ typeface is in its new designed serif letters. Special letters that can be described as having modern designs include small ‘g’, ‘p’ (with their open ends), ‘x’, and capital ‘B’, ‘P’, ‘Q’, and ‘R’ (with their open ends). ‘Ghibli’ typeface has also both of lining and old-style numerals which makes it more suitable for any literary and printing purposes. This gratuitous font comes in only two weights (i.e., Ghibli Regular and Ghibli Bold). It is absolutely preferable to be used in the wide fields related to literature and publication industry. This includes typing titles of diverse literary and academic books, readable texts of novels, novellas, short stories, prose, poetry, textbooks, newspapers, and magazines. It is also notable if chosen for designs that include movies’ titles, logos of academic institutions such as colleges and universities, organizations and associations’ names, medical packages such as those dedicated for tablets and syrups, and also other different educational and social materials. 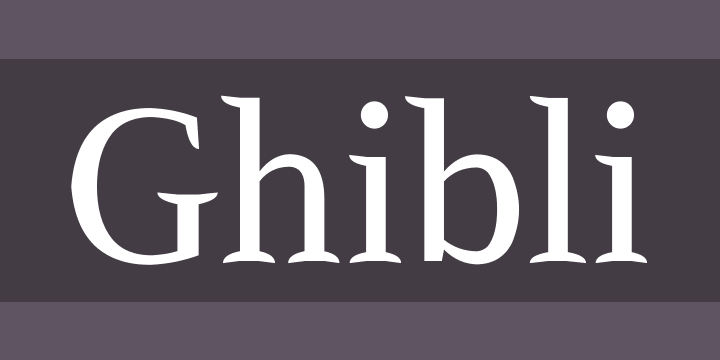 ‘Ghibli’ is simply a free literary typeface dedicated for all who want to write and read using a modern and stylish serif font. Enjoy it.